TÁNAISTE SIMON COVENEY has said solidarity with Ireland on the Brexit backstop is “as strong as it has ever been”. Labour Party leader Brendan Howlin told reporters earlier today that he has heard a “very dangerous” suggestion is being made in Europe that the Irish backstop issue should be deferred. He told the Dáil that he has been speaking to his European colleagues in other Labour parties who suggest the Irish backstop issue might be postponed. “It’s only a suggestion at this stage. But it would be deeply dangerous for Ireland’s interests. And any such suggestion must be resisted,” he said. Coveney dismissed any such suggestion, stating that at no point during his conversations with other EU leaders is anyone is questioning or undermining the Irish position. He said solidarity has been pledged by all 26 foreign ministers as well as Michel Barnier, the chief negotiator for Europe. The Tánaiste said he is in Brussels a lot more than Howlin, and solidarity is “as strong as it has ever been”. “I am not sure what sources Howlin is getting his information from,” Coveney told reporters in Luxemburg today, adding that Howlin’s sources are not as credible as the pledge of solidarity he got from Barnier in an hour-long meeting this afternoon. A government spokesperson has said there is “no basis” for Howlin’s suggestion whatsoever. 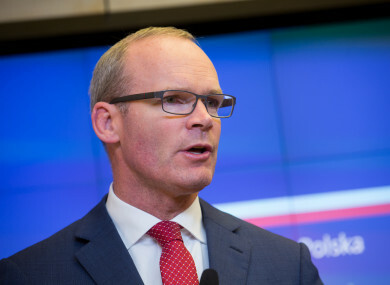 Ireland is most vulnerable to exposure post-Brexit, said Coveney, who said the EU negotiators and member States remain supportive of the Irish position. He said it remains the case that the backstop must be included in the withdrawal agreement “unless and until” another solution is found. No one wants the backstop to ever be used, but Ireland needs it to be in the agreement as an insurance mechanism, said Coveney. Tomorrow is the deadline set down for a withdrawal agreement to be signed off, however it is expected it will not get over the line. Coveney said he accepted that “more time” is needed to allow the UK and EU teams to re-engage. Another summit is expected to be held in November or December if an agreement is not struck tomorrow. The European Union President Donald Tusk has warned that a ‘no deal’ Brexit scenario is “more likely than ever before”. Taoiseach Leo Varadkar told the Dáil today that a no deal Brexit remains unlikely, however, he said Ireland has been preparing for such a scenario. The Tánaiste said a lot has been agreed so far, but reminded people today that many of the choices are difficult “because of the choices that Britain have made” and are not due to the choices the EU has made. Email “'I don't know where he's getting his information': Coveney denies Howlin claims on Brexit backstop deferral”. Feedback on “'I don't know where he's getting his information': Coveney denies Howlin claims on Brexit backstop deferral”.